Charity case studies: we currently have 24. Any agency or media owner can submit case studies to our team and these 24 are the strongest we have received, with the most recent case studies at the top of this page. If you're interested in more digital marketing case studies then review our complete case study library. If you're interested in submitting case studies then email our case studies manager to find out more CaseStudies@DigitalTrainingAcademy.com. A women’s charity in Peru took a novel approach to highlight the dangers of domestic abuse, recruiting one of the country’s biggest music stars to record a song written by a murderer before for killed his partner. Young men in New Zealand love doing dumb stuff in the water. But it’s killing them. Water Safety NZ aimed to encourage responsible swimming via social media messages from the Grim Reaper himself. Charity Addicte Aide ran a clever Instagram ad campaign this summer, which aimed to raise awareness about alcoholism among young people by creating a fake profile with a troubling secret. This case study looks at how the French organisation made smart use of social media to push a powerful message. Water is life worked with advertising agency DDB New York to hijack the popular #FirstWorldProblems and launch the ‘hashtag killer’. The ‘hashtag killer’ campaign was set out to eradicate the ironic #FirstWorldProblems used when people tweet about life burdens such as their phone battery dying or when leather seats aren’t heated and create awareness for serious issues in developing countries. In July 2014, Charity ALS started a small scale internet challenge that ended up reaching all the way to the White House. This case study looks at how the ‘Ice Bucket Challenge’ led to record donations to the charity, raising some $15.6m in contributions to the group and its national affiliates, compared with less than $50,000 in the same period last year. With an extremely limited budget, the Swedish Committee for Afghanistan launched an innovative SMS campaign that raised money for schools in Afghanistan and created a new way of writing books.This case study looked at how the organisation used a mobile campaign on a tight budget to get the highest reach possible to help those in need. This emotionally powerful video from the Animal Mayhew Centre puts a new twist on typical pet rescue charities- highlighting the happiness a rescue dog bring to their owners after a hard day. The advert went live on YouTube on the 6th March and aired during More4’s coverage of Crufts on the 7th March and has had over 10,000 shares and 1.5m views in the first month alone. Cancer Research UK received more than £8m in donations after a popular online campaign, asking women to post selfies with no make-up using the hashtag #nomakeupselfie, went viral in March 2014. This case study looks at how the charity (and a few polar bears) benefits massively from a campaign started by an 18-year-old Facebook user. Back in 2011, Barnardo’s website was attracting visitors, but few were completing their online donation journey by reaching the donate page. Working with Nomensa, the children’s charity used a combination of technology, innovation and audience analysis to optimise the donation process. This case study shows how Barnado’s generated a 17% increase in donations. Macmillan Cancer Support is a national cancer charity which provides practical, medical, emotional and financial support to people whose lives are affected by cancer. It also campaigns for better cancer care. The challenge they faced was that there was increasing traffic to their website and it was critical that users could find the information they needed quickly and easily. Webcredible suggested a new homepage displaying information on different cancer types, a redesigned contact us page, new information architecture for the online shop and brand centre, and a restructure of content within the site to better suit user needs. The Macmillan Cancer Support website has seen a substantial increase in traffic to important areas for site users which had previously been difficult to locate. For example, there has been more than a 200% increase in people finding information on financial advice. 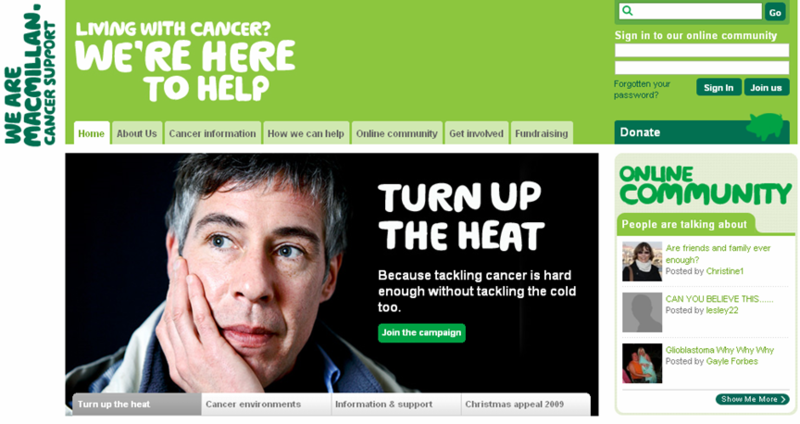 The user-centred design programme allowed Macmillan to get to know its target audiences and what information was of most interest to them. A brilliant example of taking a big idea and applying it online. Using the web as a platform for engagement, Talk Talk aligned with the Treehouse autism charity to create The Forever Story, persuading thousands of consumers to take part and collaborate in what became a Guinness world record for the largest multi-author story ever: 8000 entries, 20 hours of content, podcasts, Facebook apps - and of course, the story continues, online.